Dr Raju Kanakia completed his MBBS and MD – Internal Medicine from the Grant Medical College and Sir J.J. Group of Hospitals. After his MD medicine he went on to join the Gastroenterology Department at the Lokmanya Tilak Municipal Medical College, Mumbai. He worked towards the department recognition for National Board of Examination and became the first DNB student from this institute. During his tenure at LTMGH he trained in various aspects of gastroenterology, hepatology and endoscopy. He participated in research projects and was awarded a Pool Officer’s post through the CSIR, (Council for Scientific and Industrial Research). For his advanced training in gastroenterology, endoscopy and endosonography, Dr. Kanakia visited the Academic Medical Centre at Amsterdam and was trained by Prof. J.N.J Tytgat and Prof. Paul Fockens in 1995 and 2000. 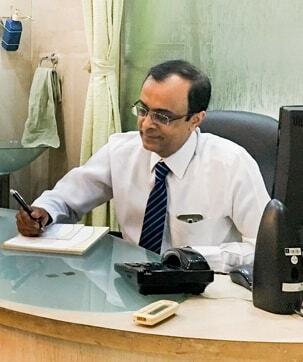 The amount and quality of time Dr. Raju Kanakia spends with his patients, understanding their delicate needs sets him apart from most of his colleagues in the field of gastroenterology. He manages diseases of gastrointestinal tract like stomach pain, acidity, GERD, diarrhea, IBS, constipation, piles & fissures, pancreatitis, gallstones, ulcerative colitis & Crohn’s disease, liver diseases like jaundice, hepatitis A-E, hepatitis B-C, fatty liver, liver & gastrointestinal cancers as well as performs various endoscopic procedures like gastroscopy, sigmoidoscopy, colonoscopy and capsule endoscopy. He is at present attached to the prestigious Lilavati Hospital and Research Centre, and Raheja Fortis Hospital. Dr Raju Kanakia’s passion for using technology for medical education made him pioneer Medivision, a Continuing Medical Education programme on DoorDarshan 2 which is the national television of India. This first and only CME programme on television in India completed 100 episodes. These CMEs were also telecast by IGNOU – Indira Gandhi National Open University. He was credited with the launch of India’s first healthcare portal medivisionindia.com, which attracted one lakh visitors every month in 2002. In 2010, Dr Raju Kanakia, established HealthVarsity, India’s first online training portal for doctors. Health Varsity has completed more than 90 CMEs. The online CMEs trained around 10,000 doctors from more than 1000 unique locations not only from India but across the globe. An excellent teacher, he is very well known for his lectures for family physicians. He has co authored Kanakia Health Express, a newsletter for doctors. Dr Raju Kanakia is a member of the Indian Society of Gastroenterology, American Gastroenterology Association & Indian Medical Association. Dr. Kanakia has been instrumental in founding the Grant Medical College Alumni Association.